Latest Netgear Routers like R6300 offers tools to check the monthly Internet traffic through the router. The tools offered by Netgear router to monitor, control and set a limit of Internet usage through the Internet port of Netgear wireless router is called Traffic Meter. 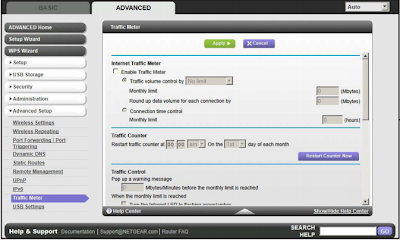 By using Traffic Meter, you can set the monthly traffic limit through the Netgear router. The limitation with Traffic Meter is that you cannot control the port wise (LAN port) control of Internet consumption by different users connected to the Netgear wireless router. You can only limit Internet usage as a router but not user wise. To control Internet usage through Netgear router by Traffic Meter, follow the steps below. To log in to Netgear router follow the instructions provided in the link below. Though Traffic Meter is useful to set monthly Internet usage through Netgear router, it does not have a feature to allocate specific Internet bandwidth limit for different computers connected to the router. To check and monitor Internet usage by different users connected to the Netgear router we may need to use third party tools. There are multiple third-party tools available to monitor the web traffic through the gateways. Those tools help to monitor, control and report any suspicious Internet usage by employees in a company. To learn how to set up wireless security on Netgear router click on the link below. We will discuss how to activate live web monitoring using security tools on home and small office network in our future articles. Netgear must find a way to redirect internet between different users. I love this way to find internet usage. I think the next time this will help me. Because I also had a Netgear router at my home.